The project POLYMIX, wherein AIMPLAS, the Plastics Technology Center in Spain, has taken part, received the LIFE Citizens’ Award for the best 2015 LIFE Environment project. 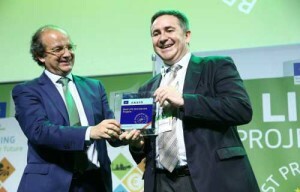 The prize was given during EU Green Week in Brussels in a ceremony held at The Egg congress center in Brussels where BREAD4PLA, coordinated by AIMPLAS, was also awarded. The LIFE Citizens’ Award gives recognition to this project, funded by European funds by means of the Life+ Program, aiming to obtain innovative asphalt mixtures more resistant and sustainable than conventional ones, thanks to the incorporation of plastic wastes in its production. These are four different types of asphalt, wherein used tires, polypropylene (PP) caps, polyethylene (PE) packages and polystyrene (PS) hangers have been added to its composition respectively. With the new mixtures, a total of 2km of a stretch of the M-300 in the approaches to Alcalá de Henares were asphalted. After a review of the asphalted stretch’s behavior, the POLYMIX project partners have reached the conclusion that the new asphalt mixtures not only comply with the requirements to be used in road construction, but also obtain a marked improvement in the resistance to plastic deformations with respect to conventional asphalt mixtures. Thus, through its use, the volume of raw materials used is its production is reduced, as well as the maintenance cost, since they have a longer shelf life.